I have finally integrated reusable bags into all of my shopping trips! Once I started remembering, I couldn’t stop! RuMe Bags are designed in Denver, Colorado and made in a fair trade factory in South Korea. A fair, living wage for all factory employees (2007 per capita GDP of South Korea is estimated at USD $24,600 per year by the CIA Fact Book). Employees have ample meal breaks, are not obligated to work overtime without proper compensation and may unionize if they choose. The factory is modern, clean, well lit and has emergency protocols in place. I typically associate Fair Trade with farmers not factories, and since these bags are made of manmade polyester, the term threw me. Many stores offer discounts for using your own bags, but our local food co-op took it a step farther. Instead of offering a discount, customers are now charged 10 cents for paper bag (no plastic option) they use. I think this is a great way to drive home the point that we should use reusable bags! Would I buy these product? No. In general, I avoid manmade materials like polyester. 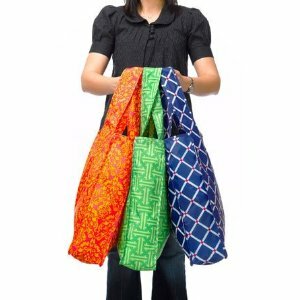 Organic cotton shopping bags work just as well and are also machine washable. What I find most disturbing about the RuMe bags is they smell really bad. In fact, they made me sneeze when I opened the package. That’s a sure sign of some sort of toxic outgassing. I just can imagine how toxic the fair trade factory is that produces these bags if they still smell when I received them. Somehow that seems to contradict the concept of fair trade. If you are looking for truly eco-friendly products for your family, the Mighty Nest is a great resource! From toys to skin care, you can trust the products featured here. We were sent Tree Hopper Toys Blocks to try out. These unique blocks are locally made in Chicago of sustainably harvested hardwoods from the Midwest. They are sanded smoothly making them safe to play with without any sort of varnish or coating that could be toxic. 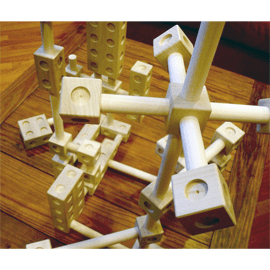 With Hopper Blocks kids will have a blast putting their creativity to work. They can build cities, robots, forests, castles, abstract sculptures and anything else they can imagine! Blocks come packaged in reusable cloth sack for storage. A grown-up version of tinker toys. This set is much sturdier, more design-saavy and the possibilities go far and beyond. We also love that Tree Hopper blocks are made with local woods from the Midwest. They also included the design of windows on their blocks for better creating buildings and cities. These blocks are unique (and should be added to our best blocks list! ), as they can be combined like tinker toys (only slightly simpler and thus more developmentally appropriate for younger kids). My son immediately put two blocks together and pretended it was a hammer. These blocks inspire imagination! Would I buy this product? Yes! These are great blocks not only for their design aesthetics but for their truly natural, made in the USA qualities. Pencils are made from wood, and although it is hard to imagine forests are clearcut for the little bit of wood in a pencil, they are. Many pencil manufacturers buy their wood from Sierra Pacific Industries, which is notorious for irresponsible logging practices, such as clearcutting and use of herbicides on plantations. Forest Ethics has ranked the most common pencils; however, a more eco-friendly option does exist. O’bon is making pencils from newspapers! 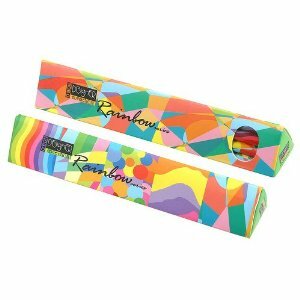 Each pack of Rainbow Series includes 10 premium 2B pencils made from recycled newspaper. These pencils feature groovy waves and circles in many bright, glowing colors that make them fun. The newspaper protects the graphite better than your ordinary wooden pencil. O’BON pencils mean a longer-lasting, higher quality pencil that everybody loves. Gear up for Back to School with these tree free pencils. Would I buy this product? Yes. They are affordable (10 pencils for $5), but they do not contain erasers. I’m actually not a big fan of erasers anyways, and I have no idea what they are made of or how toxic they may be. I think that children can obsess with erasing, and that perfection should not be the goal when learning to write. In fact, when I was in art school, we weren’t allowed to use erasers! Sometimes getting children to take their vitamins can be a challenge. Although I advocate for eating whole foods to get your daily nutritional intake, we all have met those picky eaters that need supplements, despite being offered only healthy food choices. My son is one such eater, and my daughter is a vegetarian, so we do supplement. Besides, I think vitamin D is important to take during the winter months. 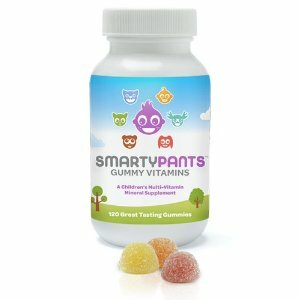 SmartyPants is a gummy vitamin made with organic cane sugar. These vitamins are made in California. Furthermore, the company supports Vitamin Angels. For every SmartyPants purchase, a 1:1 match is given to a needy child. Would I buy this product? No. They are not vegetarian, but they do contain potassium iodide, something we’ve been thinking a lot about lately. My daughter has been in search of a quality bento box for a long time. She has searched the internet for a wooden one, only to find they are really expensive, lacquered, or really plastic with a wood grain appearance. She loved her Laptop Lunch, which I grew to hate as another plastic item in the house that did not last. Furthermore, I suspect the Laptop Lunch was one of the BPA-free plastic bento boxes tested recently that leaked hormone-like chemicals. PlanetBox Complete is the eco and easy way to pack healthy, waste-free lunches. 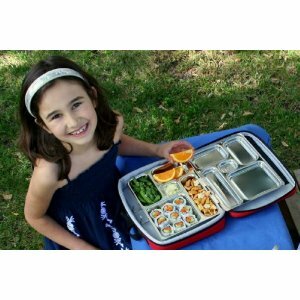 Part bento box, part TV dinner tray, PlanetBox is the custom-designed, all in one solution for packing well-balanced lunches kids love. Made out of high quality stainless steel, its the safe, non-toxic alternative to plastic. Individual compartments ensure that foods don’t touch each other and that lunch arrives looking neat and appealing. The individual compartments remind parents to pack a varied lunch which includes fruits and veggies, and makes eating that lunch quick and easy for kids. Even though PlanetBox is designed for kids, it also works great for adults who want to pack a healthy lunch without overeating. Each set comes with a PlanetBox lunchbox; 2 lidded containers with a silicone rubber seal for packing wet, messy foods; a Carry Bag made out of recycled material; and a set of hip magnets to decorate the top of the lunchbox. The PlanetBox lunchbox measures 10 inches x 7.5 inches x 1.5 inches. The Carry Bag measures 11.5 x 9.5 x 2 inches, has a pocket to hold your own water bottle (bottle not included), and a separate compartment to hold a snack. Dishwasher safe. Not designed for hot foods. Safe, non-toxic, non leaching materials – NO lead, PVC, phthalates, or BPA. 5 year warranty on metal components, 1 year on soft goods. Not your old fashioned metal lunch box, PlanetBox delivers lunch transportation for the green generation. Would I buy this product? Yes/No. The PlanetBox is expensive ($59.95), but if it lasts as long as I think it will, I will never buy another lunch box/bag again for my daughter. We are so excited about this product, but I am not sure I can afford to buy one for my son too. Thanks for the thoughtful review, Jennifer. While we have to encaspulate the fish oil in gelatin (as many vits do) to keep them from tasting fishy we do have a vegetarian version coming out in late 2011 so stay tuned! Our vitamin is unique in being the only all-in-one vitamin that contains eco-friendly omega 3’s (not sourced from tuna), 100% vitaminD3 (vs. just vitamin D, d3 is the more easily absorbed version of vitamin D) and a full multivitamin. thanks again for giving them a try -Courtney Nichols, CoFounder, SmartyPants. We look forward to your veggie version! I was pleased to see the D3 too! My son does love these. Another vegetarian here who would love to see a version without fish oil or gelatin! The eco friendly lunch box looks great value. I hope it stands the test of time the problem with most products and their carbon footprints is they are easy to replace. The price tag is important also as it’s not a throw away price which should help you take care of it like it deserves to be. Great points! Another great thing that happened in our home as a result of the PlanetBox is my daughter was inspired to pack her own lunch (she even packed her brother’s too). This busy mom was very pleased. Jennifer – thank you for taking the time to review our products. This is the first time we’ve ever heard a complaint regarding the scent of our bags, and we’re sorry that you didn’t have a better experience with our products. We do take great care in the manufacturing and shipping of our products, and great pride in the responsible, fair trade production of our durable bags that help reduce the 100 billion single use bags that are used in the United States each year. Please let me know if you have any additional questions about our products. Jae Lee, Co-Founder, RuMe, Inc. If it is any consolation, the odor has dissipated.